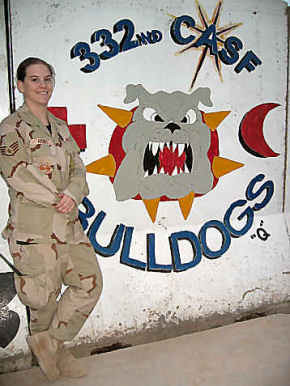 The following is a brief biography of Steve Grubb's daughter - Sabrina, now serving in Iraq. Her unit, mission and responsibilities are also shown below. 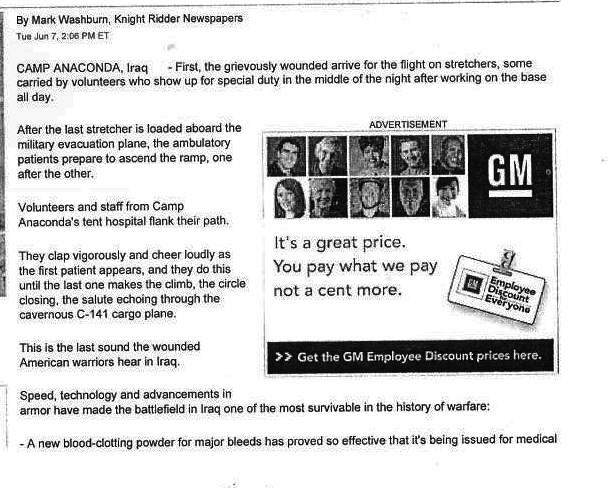 Further down you'll see a newspaper article about an amazing tent hospital called "Camp Anaconda" . The hospital works in conjunction with Sabrina's unit. 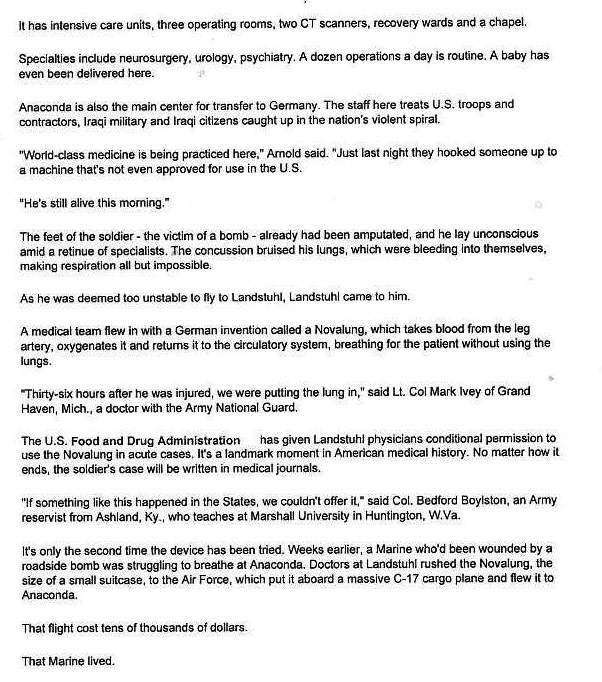 You may note that her unit is the last link for these wounded soldiers between the Iraq/Afghanistan Theatre and "the World". 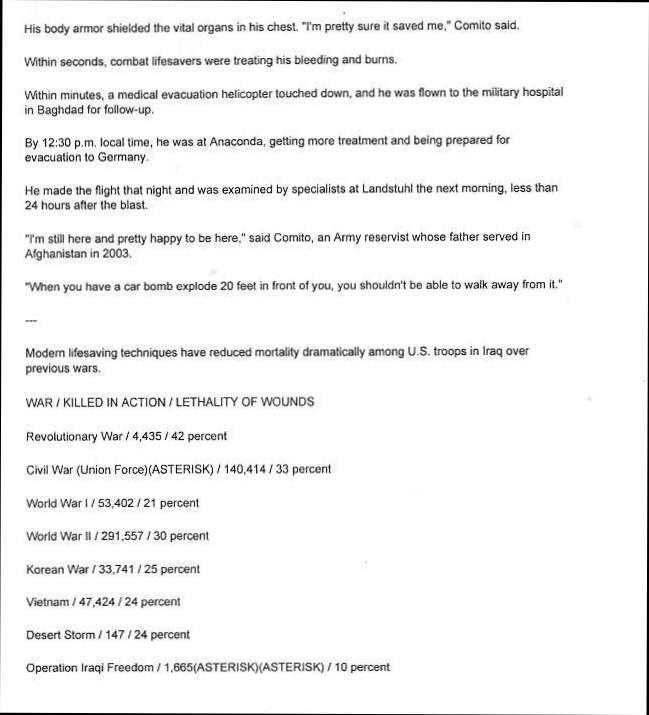 Also noteworthy is the last line of the newspaper article pertaining to mortality rates. It's truly unbelievable! Thank you Sabrina for your courage and all that you do for our country and these brave men and women who are under your care. 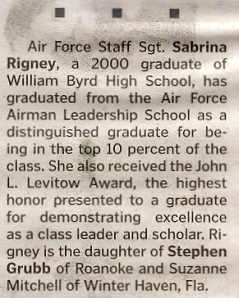 Twenty three year old female SSgt (E5) USAF. Born and raised in Roanoke, VA. Joined the military after graduating high school. Strived to succeed in A.F. and was promoted to E4, 6 months early, and made E5 the first time eligible for promotion. Job title is Aerospace Medical Service Craftsman, currently hold certification as an Emergency Medical Technician Basic through the National Registry of Emergency Medical technicians. Primary duties, when not deployed, are that of a licensed practical nurse. 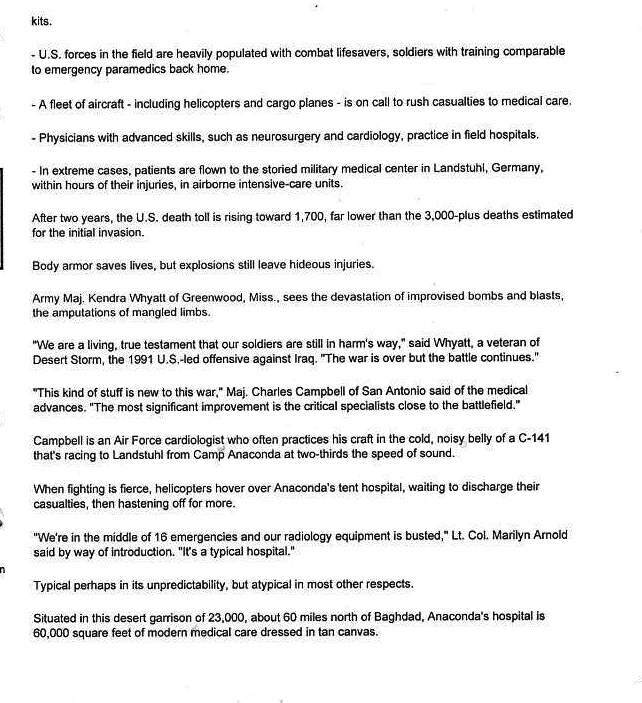 Been stationed in Utah (Hill AFB) and Maryland (Andrews AFB) and deployed to Kuwait (summer 2002) and now Iraq. Completed Associate's degree in Allied Health Sciences through the Air Force Community College with a 4.0 GPA and a an associate's degree in Criminal Justice through Park University with a 3.85 GPA. Currently two semesters from completing Bachelor's in C.J. through Park. Mission: We provide supportive medical care to stabilized patients waiting for aeromedical evacuation to Kuwait, Germany, etc. We operate 24/7 providing ground transportation for patients entering, transiting and leaving the southwest asia area of responsibility. 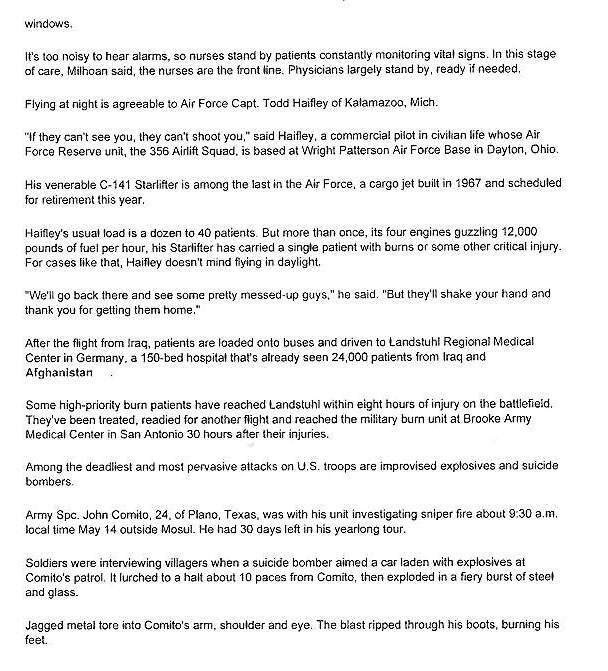 One notable thing about this base is that we have the only Air Force Theater hospital in the world. We're the first to have one since Vietnam. 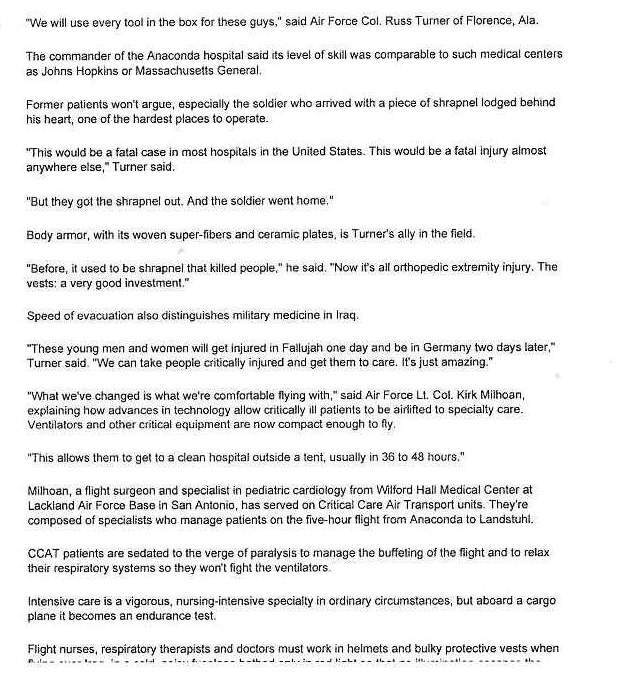 The CASF is not attached to the hospital because we have to be very close to the flight line, and the hospital is on the other side of the base. The CASF picks up patients that are stable from the hospital and serves as a medical holding facility until they are put on a plane out of here. We also pick up critically injured or sick patients and transport them from the hospital directly to a waiting plane. We have the capability to surge and handle up to 100 patients, although we usually don't have any more than 50 in house and we usually don't keep them for more than 24 hours but it can be up to 72 hours depending on what else is going on. We also respond to any in flight emergency with a flight doctor and an ambulance just in case.